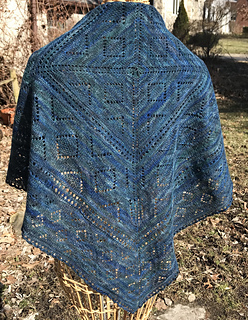 There is a KAL for this shawl in my group, running until the end of April 2019, do come and join us and show off your work. 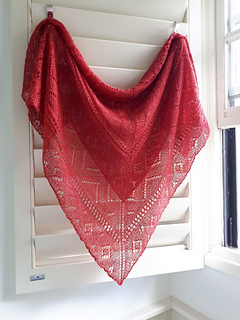 The shawl is named for my aunt, who requested a shawl in “Lipstick Pink”. 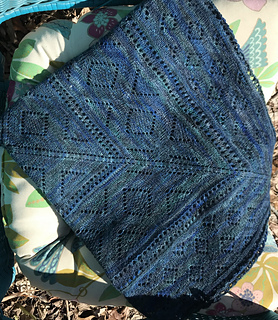 The shawl I knitted for her gave me a very close run of yarn chicken, so I’ve refined the pattern and made it slightly smaller, so that the same doesn’t happen to you. 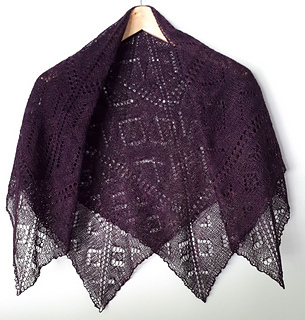 The shawl is a square designed for lace weight yarn and uses simple lace eyelets together with textures of stocking stitch, reverse stocking stitch and seed stitch. It is knitted from the centre outwards in one piece. All rows include both knitting and purling including purl decreases, so a certain level of concentration is required. Both charted and written instructions are included in this pattern. My blocked and relaxed piece as knitted measured approximately 90cm square, however the final size will vary according to your own choice of yarn and needle, as well as your knitting tension. 2.75mm needles or larger to get desired gauge – 5 small dpns and circulars. At least 4 stitch markers, 1 different from the rest. Wool needle to darn in ends. 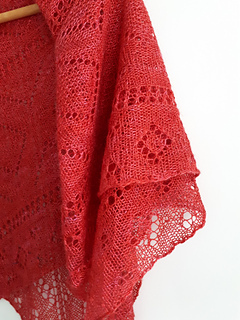 Gauge in lace knitting can be a personal matter and is an aesthetic choice rather than a practical one. I knit on the loose side, and so many knitters are better with larger needles than I use to get a similar gauge. 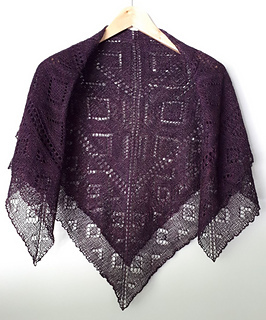 My purple shawl had a final gauge after blocking and relaxing of 17 stitches per 10cm/4in. On the needles and unblocked it was around 21 stitches per 10cm/4in. 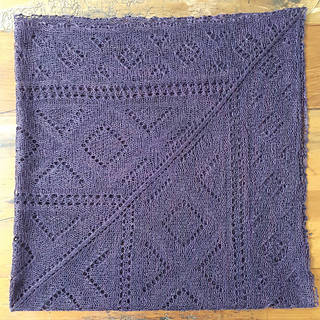 I recommend knitting a swatch using part of the pattern and blocking it to check your gauge. For lace I sometime swatch using a variety of needles, increasing size every 6-10 rows to see which I prefer when it is blocked. 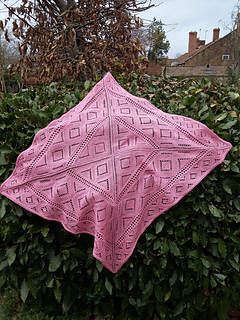 The pattern uses an invisible circular cast on, and Jeny’s surprisingly stretchy bind-off, and there are links to instructions for both of these on the useful links page in my group.